The recent advancement in laser technology has brought in a revolutionary comprehensive approach to cosmetic dental procedures. 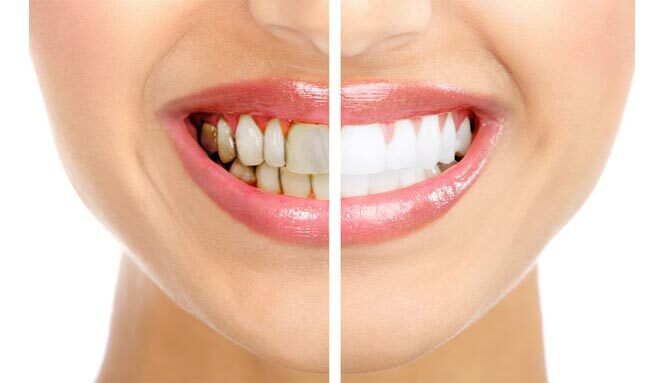 One among them is the laser teeth whitening and is the most advanced form of bleaching technique to remove stains and discoloration of the teeth. The laser teeth whitening procedure uses special whitening agents and diode laser devices to remove the stains from the surface of the teeth. The laser device emits laser beams of specific wavelengths from the diode and breaks up tiny molecules of stains that are deposited from foods and beverages. The procedure removes stains and discoloration of the teeth and improves the tooth shade to a great extent. The main advantage of the laser teeth whitening process is that the teeth whitening can be accomplished in a single visit with an instant to renovate the smile and improve the aesthetic appearance of the teeth. The lasers beams speed up the chemical reaction of the whitening agent applied on the teeth surface and produce a faster result with minimum teeth whitening sessions. At Ivory dental clinic, laser teeth whitening is performed under the supervision of a qualified dentist. The laser teeth whitening procedure remove stains faster and can be used to bleach one tooth at a time. Screening: The dentist conducts an initial screening to see if the gums have receded to expose the tooth root. Pre-Treatment: The pre- treatment is the preparation step and includes cleaning the teeth and ensure that all cavities are treated and filled before the bleaching process. Medication: Tooth whitening agent can cause temporary sensitivity. To avoid this, medications are prescribed prior to the first whitening session. The Whitening: The dentist begins the actual bleaching process by holding the mouth open with a plastic or rubber guard. A barrier gel is applied over the gums to protect them from the whitening agent. Next, the dentist uses a syringe to apply the whitening agent to the front of the teeth and uses a pen-style laser to activate the compound. From the energy of the laser beams the compound is activated and starts to foam and lifts the stains from the surface of the teeth. After all of the teeth have been treated with the whitening agent and laser beam, the dentist will allow the foam solution to remain for a few minutes. Later the foam is wiped off using a small vacuum tool. A new layer of compound is applied and the process is repeated as many as three times. After completing the bleaching process, the mouth is rinsed out gently and removes the protective layer from the gums. After a laser teeth whitening session, there is an increased sensitivity for few days and medications are prescribed to avoid or reduce sensitivity. Follow up appointments are necessary to see the progress of the bleaching and it is highly recommended to avoid highly acidic food and beverages including tea, coffee and red wine to have long lasting results. Using laser teeth whitening procedures, stains and discoloration can be effectively removed from the teeth surface and have whiter teeth in just one sitting. We are quality in services by a team of well-experienced and qualified dental surgeons at affordable rates. To know your laser teeth whitening and treatment cost, book an appointment now.